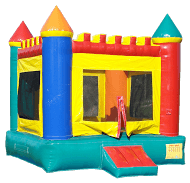 Make your next party, family reunion, school fun fair, public or corporate event extraordinary with the addition of bouncy castles - fun for both children and adults! Package deals available - contact us for details. 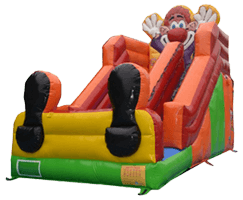 Any inflatable rental to be used on property other than a private residence MUST be TSSA-registered for insurance purposes (All in 1 Events & Inflatables carries $5 million event insurance coverage). 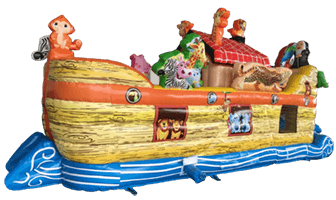 Do you need TSSA-registered inflatables for your event? Click here to find out. 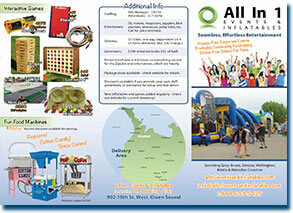 Standard single-room bouncy castles - each will accommodate up to 8 riders or 750 lbs. Perfect for The Little Mermaid fans! 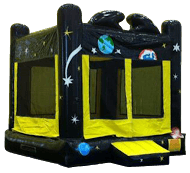 Channel your inner astronaut in this space-themed bouncer! 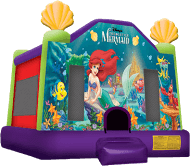 These bouncy castles each include a bouncing space, a slide and interactive activities. Each will accommodate up to 8 riders or 900 lbs. Perfect for your little princesses! 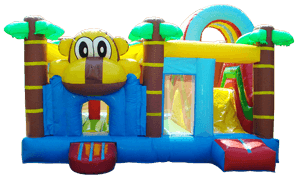 Monkey around in this fun jungle-themed bouncer! 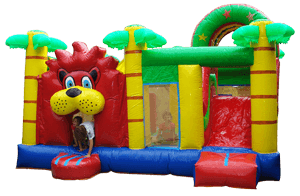 Have fun "lion" around in this jungle-themed bouncer! 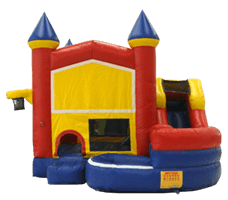 These extra large bouncy castles each include a bouncing space, a large slide, a basketball hoop and other interactive activities. Each will accommodate up to 8 riders or 1200 lbs. 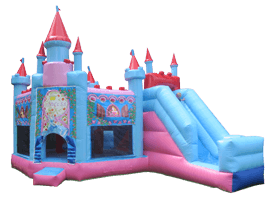 An extra large castle for your little princesses! Go adventuring in this safari-themed bouncer! These castles are all TSSA-registered, meaning that they are suitable for either household use or public events. 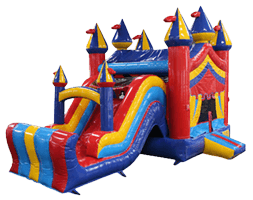 This extra-large castle includes a bouncing space, a basketball hoop and other activities, plus a WATERSLIDE! (Can also be used without water). Accommodates up to 8 riders or 900lbs. 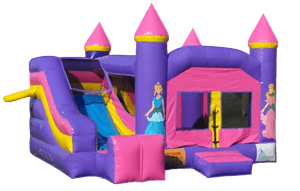 A small footprint makes this castle perfect for little kids and even the littlest back yards! Accommodates up to 6 riders or 400 lbs. Midway Carnival Combo - NEW for 2018! 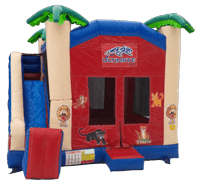 Bring the carnival home with this midway-themed bouncer and slide! Accommodates up to 10 riders. 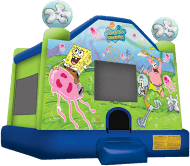 SpongeBob Squarepants™ features on this fun bouncy castle! Accommodates up to 8 riders or 600 lbs. 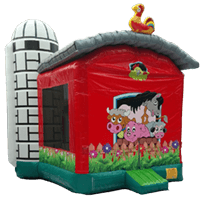 Farm Bouncer - NEW for 2018! 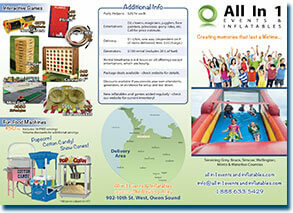 Includes inflated activity in the center for even more fun! 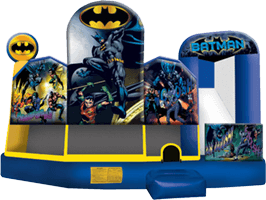 This extra-large Batman™-themed castle includes a bouncing space, a large slide, a basketball hoop and other interactive activities. Accommodates up to 8 riders or 1000lbs. 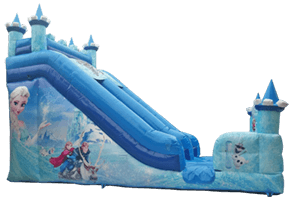 These giant slides add tons of fun for any event! Each will accommodate up to 4 riders or 600 lbs. Clown Slide 2 - NEW for 2018! More clowning fun with this two-lane slide. Accommodates 2 riders. Everyone will be "clowning around" with this two-lane giant slide! Obstacle courses provide tons of fun for children and adults, alike. 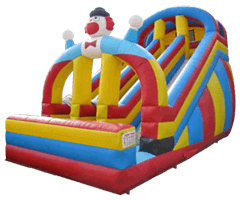 Combine multiple courses or other inflatables for the ultimate challenge! Each will accommodate up to 4 riders or 600 lbs. Castle Obstacle Course - NEW for 2018! 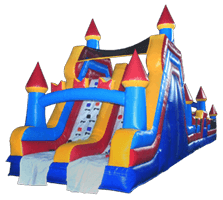 Up the wall & down the slide is just the beginning of this huge 60-foot long castle-themed obstacle course! Fun, colourful animals feature throughout this obstacle course that includes climb-overs, punching bags, and a slide! 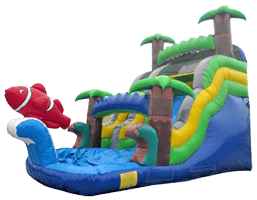 This sports-themed inflatable combines multiple obstacles for 50-feet of challenging fun that will have you going over, under, around & through! Nothing attracts people more on a hot day than water-based fun! 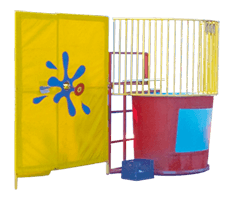 Put your friends, family or local celebrities on the spot when they take their turn on the dunk tank! A perennial favourite, players test their aim to hit the bullseye with baseballs and drop the person in the hotseat into the cold water. Tank features a large window so spectators can enjoy the splashing action! Great fun for everyone! Nothing beats the fun of a water slide on a hot day and this giant tropical-themed slide delivers! Accommodates up to 3 riders or 600 lbs.